I’ve ventured halfway into Rhodes due to story relation, my god it’s becoming my favourite place at the moment! I tried really hard to ride through the Great Plains and after 5 attempts I finally made it to Thieves Landing only to become wanted there and instantly killed. I also tried to use a boat to get to New Austin but the raft randomly threw me over and I drowned as soon as I got close to New Austin. I'm sure there's a reason for it, but I don't want to be spoiled checking the Mapping thread. Wanted even in Thieves' Landing? Is there no lawless town in this game? It's about to be pee pee pants city here REAL soon. I believe that anywhere past blackwater, you're instantly wanted. Also sorry for my grammar/spelling. I slept for 3.5 hours because of this game. When I got into Thieves Landing, I barely was 10 feet over the bridge until I was shot to pieces. It literally said Wanted in New Austin, or something like that. Can we have a short video thread? 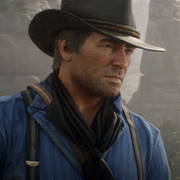 Yeah it said Wanted Dead or Alive but i had another pop up saying something about Arthur being wanted in New Austin, too. Like West Elizabeth. Reading here, I was convinced this was indeed good. On Chapter 2 now, and f*ck-in-hell. I don't know if I have the words! I know this probably sounds dumb but I cant find any of the ps4 early access content. Anyone know where to look? Damn I was really hoping if I could just get to New Austin the law would leave me alone, but I guess its locked off until late game. Best game I have ever played by a large margin. Its the little things that make this game something special...never have I played a game like this. The way it makes me feel, each little movement...the way Arthur holds the gun powerfully...the intricate horse movements....the weather...the gang....My God. One complain i have with this game is the game starts REALLY slow until you're in Chapter 3 then you can do alot of cool stuff. Yes, I have ~17 hours and I'm still in Valentine, did 2 story missions. I'm not exaggerating or anything, and I'm sure many others will agree, the game has the most natural-looking lighting and environments compared to other games, even topping games with static lighting like Uncharted 4. I've never felt more satisfied roaming the mountains and countryside in a video game. I love all of it so f*cking much. This game is unbelievable. It feels like a real life simulation set in the wild west. If anybody has access to a New York times it has a really nice poster of RDR2 in today's edition. The attention to detail is just astonishing! Even the dead body of a deer is getting pushed in because of the horse movements when carrying it on the horses back... Also you can see the horses body breath/move when breathing. Talk about the attention to details, some lawmen picked up the bodies of some people I killed on their horses and took off, this game is ridiculously detailed. Well it's obvious why right? RDR is a game that is at it's peak with this pace and tone. This tone will never fit in a GTA but it's absolutely perfect in RDR(at least from what I've seen so far). R* seem to understand when something is appropriate nowadays. St Denis has blown my socks off. Incredible city.